Yellow Pages Advertisement Canberra Directory 2015 Roofing - Durelec, Your Friend in the Trade. Roofing: Adelaide, Brisbane, Canberra, Darwin, Melbourne, Perth, Queanbeyan, Sydney, Wollongong. Yellow Pages Advertisement Canberra Directory 2015 Roofing. Raining Inside? Need it Fixed Yesterday with a 100% Guarantee and No Weekend Penalty Rates Between 8am and 4pm? 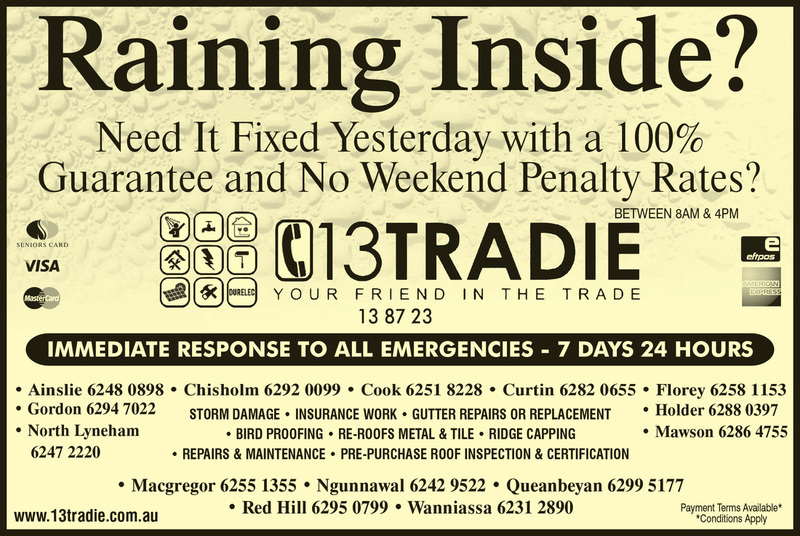 Call 13TRADIE 13 87 23. Immediate Response to all Emergencies 7 days - 24 hours. Storm Damage, Insurance work, Gutter Repairs or Replacement, Bird Proofing, Re-Roofs Metal and Tile, Ridge Capping, Repairs and Maintenance, Pre-Purchase Roof Inspection and Certification. Seniors Card, Visa Card, Master Card, Eftpos, American Express. Payment Terms Available conditions apply. Adelaide, Brisbane, Canberra, Darwin, Melbourne, Perth, Sydney, Wollongong, Queanbeyan. Call13TRADIE - We'll get the job done!